Italian police have arrested two men who were allegedly trying to deposit trillions of euros in fake bonds in the Vatican bank. Officials say the pair, an American and a Dutch national, claimed they had an appointment with bank officials to gain entry but were handed over to police. Fake bonds with a face value of 3tr euros ($4.1tr; £2.5tr) were found in their briefcase, the officials say. The suspects were reportedly hoping to open a line of credit at the bank. The bank - officially called the Institute for the Works of Religion - runs thousands of private accounts held by cardinals, bishops and religious orders all over the world. The two suspects were later released pending further investigation, Financial Guard police officer Davide Cardia told AP news agency, as Italian law does not require arrest for fraud investigations. The Vatican has been tightening up banking procedures after criticism by a European watchdog body that it has been used as an offshore fiscal haven. Pope Francis has ordered a complete overhaul of the bank and a detailed inquiry into the transparency of its transactions. 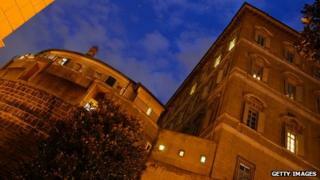 The pontiff sacked two former directors who now face possible trial on money-laundering charges.